1Locate the Windows Start button on the lower-left corner of your desktop and choose Start→Skype to launch Skype. 2Enter your Skype username (that is, your Skype Name) in the Skype Name box. 3Enter your Password in the Password box. 5From the Skype menu, choose Contacts→Search for Skype Users. 6Enter the person’s name in the uppermost text box. 8Enter location information into the Country/Region, State, and City fields. 9Select a language from the Language drop-down list. 10Select a gender from the Gender buttons. 11Select an appropriate age in the Age Range dropdown. 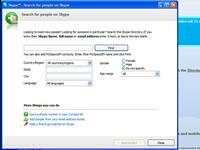 12Click Find to find skypers matching your search terms.